Croatia’s economy continues on its path of recovery, with GDP up by an estimated 2.5% in 2016. Growth is backed by a rise in domestic demand, both household consumption and investments. 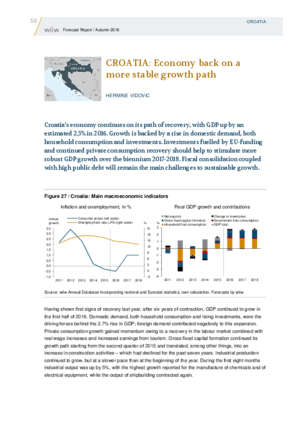 Investments fuelled by EU-funding and continued private consumption recovery should help to stimulate more robust GDP growth over the biennium 2017-2018. Fiscal consolidation coupled with high public debt will remain the main challenges to sustainable growth.